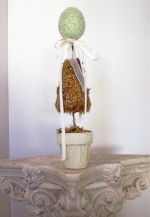 Our adorned pastel Easter egg and moss cone topiary distinguishes itself from our most petite Easter Egg topiary by blending the historical conical topiary shape and ornamenting the top with a encrusted pastel Easter egg. This sparkling Easter egg proudly grows itself on a verdant bed of overflowing sheet moss and centers itself inside a hand-painted terra cotta topiary base. The beautifully painted topiary base features a shabby-chic, three-step crackle paint finish appropriately displayed in an eggshell overtone with antique gold crackle undertones. Each of these adorned pastel Easter egg and moss cone topiaries is gracefully accented with a trio of silk and sheer bows in coordinating pastel ribbon that cascades enchantingly on all sides of the topiary at varying lengths. Don’t even think about celebrating this spring without displaying a cluster of these delightful Easter egg and moss cone topiaries! Purchase a single topiary or take advantage of our pairs pricing discount to be able to enjoy more than one at a time. Experiment with different design patterns and display multiples of these delightful pastel Easter egg topiaries in varying heights or delight your guests by displaying them down the middle of a table to create a simplistic spring design effect. Be sure to shop all our egg topiary selections to acquire all three of our Easter Egg topiary styles for a delightful springtime design statement!